In this post we’ll see how to change a folder icon with Powershell, this method will work on shared folders too, as long as the filesystem of the shared network folder allows it. The script is very simple, but first I want to go through it with an example, you can scroll down to the end of this article to checkout the script. Let’s have a look at the difference between a local folder’s properties and a shared network folder’s properties. A trick to allow us to change icon on a shared network folder, would be to move it on the desktop, change the icon and move it back. Totally ugly and useless if you have a large folder or multiple folders to customize. If you change the icon of a local folder, you’ll notice that a Desktop.ini hidden file is created. When you copy that file to another folder though, nothing happens. The reason is because the folder attributes must be changed as well in order for Windows to read the Desktop.ini file. Let’s work with an example and go through it. Say we have Folder1 and Folder2 in our local environment. We change the icon for Folder1 manually. This is how Folder1 and Folder2 will look like now. Let’s change the icon for Folder2, using the same desktop.ini file. You can just copy it from Folder1 and paste it in Folder2. Once done you’ll see that nothing happens as already explained above. Let’s compare the attributes of both Folder1 and Folder2 and see what’s the difference. By going through the above, we’ve identified the reason why the folder, even with a Desktop.ini file, isn’t changing its icon. We need to set its attributes to ReadOnly, Directory. Right after running the above command, you’ll see Folder2 changing icon almost instantly. I don’t like having files laying around in my script directories, unless I really have to. So, the script below is a quick way to get the icon changed, without needing to copy any Desktop.ini file. Instead, we’ll just create it based on a static content ($DesktopIni). Write-Warning "The desktop.ini file already exists." 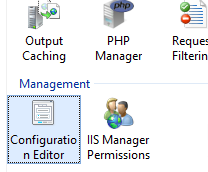 In this article, I want to go through a little issue I had when running Shell_Exec() in PHP, running in IIS, with Windows Authentication turned on. I was seeing the user running the web page was the one executing the scripts (Shell_Exec()) instead of the service account I set on the application pool. I noticed because I was getting a lot of access denied errors back from the results of Shell_Exec(), in PHP. 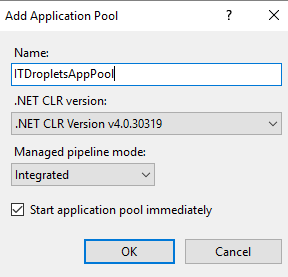 I’m going to first show you how this test web app is setup, to replicate the scenario and then I’ll show you a simple config change that will allow you to run also your scripts as the App Pool account. If you’re only interested at how to allow to run scripts as a service account, whilst Windows Authentication is turned on, scroll down to “Solution”. In the Advanced Settings, I’ve set the pool to run as a domain user (ie: itdroplets\myserviceaccount). I then created a simple web application under the Default Web Site. As you can see, I set it to use the Application Pool created in Step 1. Next, let’s disable Anonymous Authentication and enable Windows Authentication. This is clearly not good when you want to run scripts with the service account. Click on the web application and open Configuration Editor. In Section (1), go to system.webServer/serverRuntime and change authenticatedUserOverride from UseAuthenticatedUser to UseWorkerProcessUser (2). Make sure you click on Apply. So now, all scripts running with Shell_Exec() will be ran as the service account stated in the Application Pool. 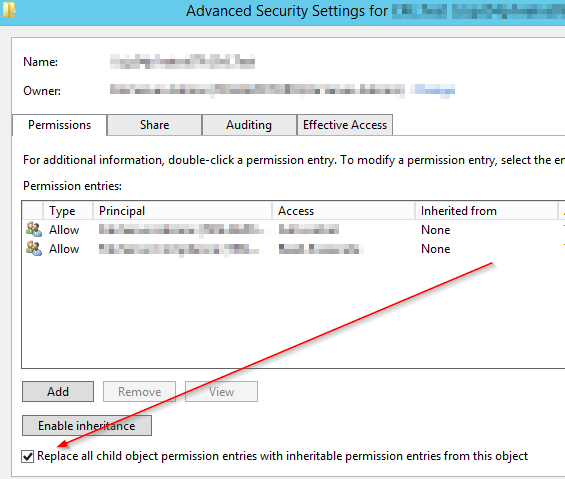 How could would it be if in Powershell there’d be an option to Replace all child object permission entries with inheritable permission entries from this object, like we have in the GUI when applying permissions? Well, there isn’t :), at least not for now (20181003), but I found a workaround that seems to be working pretty good. When would we need this? I hope you don’t actually have such a permission mess, as this would be bad, however this is just to generalize the example. Let’s also say that Folder1’s permissions are ok and we want to make sure they get replicated under every item recursively. So we want to remove Mark from accessing File1.txt, Simon from SubFolder2, Michael from Sub-SubFolder1 and also, we want to re-enable the inheritance from Sub-SubFolder2 (removing John as well). This is something you can force through with the GUI by flagging Replace all child object permission entries with inheritable permission entries from this object in the Advanced Security Settings. So, this is fairly simple, but it’s really not cool when you’re trying to automate a permission setup process.